Answering Your Questions About Oil Industry Work! Q: What jobs are available in the oil and gas industry? A: Of all the industries in the entire world the petroleum industry is about as big as they get. Therefore, there are a wide variety of employment opportunities. There are highly specialized jobs that require lots of schooling (Master's, Ph.D) such as petroleum engineering positions or jobs in the geosciences arena. Currently, there is a major shortage of workers with training in oil exploration. You don't need a college education to get into the industry, however. Many jobs are entry-level or require very little specialized training whatsoever - floorhand and roughneck jobs, maintenance positions, you name it. Our JobCenter makes it easy to find exactly the types of jobs you're after. To see the many types of jobs we cover check out the OilJobFinder site map. Q: Can I find a fracking job on OilJobFinder? A: Maybe you've heard about fracking in the news or read about it. This relatively new way of accessing and producing oil and gas from shale deposits is creating incredible opportunities for job seekers. In our membership section we explain what fracking is, where it's happening, and provide informative videos. Plus, you'll find all the latest jobs with leading fracking companies in our JobCenter. Q: How much can I earn working an oil industry job? A: In general, there is a shortage of oil industry workers. There simply aren't enough engineers, people with training in the geosciences, or people willing to do the physical work required of a roughneck or rig worker. Because of this earnings and benefits can be excellent. Many people who work oil rigs average, over the course of a year, 6 months of work and 6 months of down time. Because many work locations are remote the employer provides your room and board. Most companies also offer a generous benefits package that often includes: medical and dental insurance, life insurance, disability insurance, 401K plan, profit sharing plans, vacation time, etc. People coming out of college with undergraduate or graduate degrees appliable to the petroleum industry can receive pay exceeding $60,000 per year plus signing bonuses. Each section of OilJobFinder discusses the types of jobs available and the earning potential. Q: Where are most of the jobs in the oil industry? A: Oil and gas companies tend to be located in areas where there's lots of oil and gas. Kind of a no-brainer. In the United States many of the 'corporate' jobs with oil companies are in Houston, Texas, Anchorage, Alaska, Alberta, Canada, and so forth. The top oil producing countries are Saudi Arabia, Canada (because of their Oil Sands), Russia, the United States, Iran, and China. In the United States most oil comes from Texas, Alaska, California, Louisiana, and New Mexico. If you've heard about fracking, then you know there is a major drilling boom happening in several US states. Oil exploration and production is pretty much a worldwide endeavor. Q: Do I need to be a United States Citizen to use OilJobFinder get jobs in the oil industry? A: JobSeekers from any nationality can use the employment resources on OilJobFinder. The website is written in English, so it is important that you are able to read English in able to get the most benefit out of a membership to OilJobFinder. The oil industry is truly global in nature, and our JobCenter includes company listings for multi-national companies that have operations here, there, and everywhere. Ultimately, each country has its own labor laws and visa requirements. Laws in the U.S. tend to be tougher making it harder for non-U.S. citizens to find jobs. Our website discusses what it takes to get an oil sands job in Canada. There it's best to be a Canadian citizen if you hope to land a blue-collar position whereas they often 'import' non-Canadians for specialized engineering and science oriented positions. This pattern of hiring holds true in other countries as well. OilJobFinder is a useful oil and gas employment and information resource no matter your citizenship. Q: How do I go about finding a job on an offshore oil rig? A: Your oil rig job search can actually start with OilJobFinder. Using information found in our Members Section you'll learn all about the oil production (drilling) sector. Use our JobCenter to search an extensive list of exploration and production companies as well as drilling contractors and offshore services companies. Each company's job listings - and other helpful career information - are listed on the profile. During every session of congress it seems the House and Senate discuss opening up America's coastlines or more of the gulf to more offshore drilling. It's being discussed right now! OilJobFinder is tracking the bills in congress and will let its members know when new offshore drilling job opportunities may be available. Q: What are the living conditions like on an offshore oil rig? A: While it is true that accommodations on offshore oil rigs are sometimes cramped and privacy is hard to come by, many find the experience similar to their first year in college dorm, but without the homework. Rig workers eat great food in a dining area, have a place to sleep and read, and the work schedule allows for shore time. On the rig deck it's extremely busy, noisy, and dirty. Q: Do oil rig crew members work a lot of hours? A: Most oil rigs are operating 7 days per week, 365 days of the year. Depending on the size of the rig there are between three and four crews working in shift rotations. Typical shifts are 8- to 12-hours in length. Crewmembers often go 8 hours on and twelve hours off. A: Oil industry employers put employees through extensive operations and safety training to prevent accidents and environmental damage. Worker injuries and equipment damage can result in downtime, lawsuits, poor crew morale, inefficiency, and so forth. 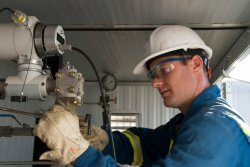 If you're hired to work on a rig or at a refinery or on a pipeline operation expect both initial and ongoing safety training. You will encounter routine emergency drills throughout your employment. Q: Does OilJobFinder talk about the Canadian Oil Sands? A: The oil sands have propelled Canada into the upper eschelon of oil producing countries. We talk about Canadian oil sands in great detail on OilJobFinder. More importantly, our JobCenter profiles the oil sands employers and lists many of the newest job postings. Q: Is it possible to find an Alaska oil job? A: Definitely. Most people know that up to 10% of America's oil comes from Prudhoe Bay in Alaska. The oil is produced -- brought out of the ground -- in the far north and transported south by the trans-Alaska pipeline to refineries and tanker ports. Every major Alaskan oilfield employer is profiled in our JobCenter, and you'll find their jobs here too! Our JobCenter includes Alaskan oil company profiles you can search for current job openings. Additionally, we provide the best resources for keeping track of the Alaska Natural Gas Pipeline project so you can jump on opportunities if and when they're available. A: Subscriptions to the Member Services section are very reasonable. We charge $12.95 for 30 days; $29.95 for 90 days and just $49.95 for a full year. We also offer a $3.95 five day trial memebrship, because we want our customers to be able to try our service for the lowest price posible. We are fully convinced you will think a membership is an excellent value. If you are even remotely considering spending some time working the oil and gas industry, a subscription to our Members Service is well worth the price. For your convenience, our memberships do automatically renew until cancelled. When you are ready to cancel your membership, we make it very easy, simply go to our MEMBERSHIP CANCELLATION PAGE. The transaction will show up on credit card statements as "JobFinderSites.com - (866) 721-6083". A: You can retrieve lost or forgotten Passwords by going to our Password Retrieval Page and follows the instructions. A: You can easily cancel your membership through the MEMBERSHIP CANCELLATION PAGE. If for some reason you are having problems canceling your membership through the link above, you can give us a call at (866) 721-6083 (24 hours per day / 7 days per week). If all representatives are busy, you will automatically be put into our automated cancellation system. You will need to leave your first and last name (please spell your last name), your phone number and your login name (if you know it). We will consider your membership cancelled from the time you call and leave us this information. If you would like a confirmation email, please also leave your email address (make sure to speak slowly and spell out your whole email address). *Please do not send a membership cancellation request by email.